Experience the natural beauty of Colette’s by strolling through enchanting gardens, towering cedars and lush evergreen forest. Enjoy the sweeping panoramic view with almost 400 feet of ocean frontage overlooking the Strait of Juan de Fuca showcasing British Columbia, the San Juan Islands and Mount Baker. Colette’s outdoor sanctuary, with its winding pathways and tranquil viewing benches, creates a beautiful and romantic setting. 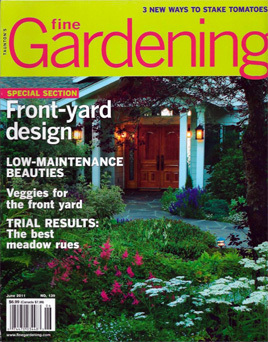 Colette’s was featured in a special section on Garden Designs – Showcasing Colette’s stunning Four Season Gardens. The gardens are designed to be beautiful and colorful throughout the year as shown in this extensive 8 full page article. For over 60 years, the grounds of Colette’s have been transforming into the magnificent horticultural extravaganza they are today. Colette’s is a breathtaking 10 acre oceanfront estate nestled between the majestic Olympic Range and the picturesque Strait of Juan de Fuca. This unique area is the gateway to Olympic National Park, a world of stunning coastline with booming surf, wave manicured beaches and sweeping vistas in every direction. For over 60 years, the grounds of Colette’s have been transforming into the magnificent horticultural extravaganza they are today. Colette’s is dramatically perched on high bank oceanfront overlooking the Strait of Juan de Fuca. This vista provides a stunning backdrop for this Pacific Northwest gem. Enjoy the sweeping panoramic view with almost 400 feet of ocean frontage showcasing British Columbia, the San Juan Islands and Mount Baker. The wooded entry of this secluded hideaway allows guests to meander beneath the canopy of soaring trees, along flagstone pathways lined with lush foliage accented with colorful blooms and through the fragrant fountain courtyard. The experienced gardener leads a staff in designing and maintaining the constantly evolving grounds as trees, plants and flowers change with the glorious seasons. Indigenous local species, as well as unusual exotic species were brought in to shape this property. Magnificent ancient cedar trees, hundreds of multi-colored rhododendrons and thousands of vibrant flowering plants beautify the landscape. Unique accents include a katsura tree and a Forest Pansy redbud tree with their brilliant autumn colors, the stunning ornamental cardoon displaying its purple thistle blooms, and one of the largest herbaceous perennials in the world, the South American gunnera spreading its gigantic leaves. Experience the beauty of your surroundings by strolling through Colette’s 10 acre outdoor sanctuary including enchanting gardens, towering cedars and lush evergreen forest. Over the years, the property has developed into a romantic retreat that reflects the natural beauty that is the Pacific Northwest. The gardens are currently being designed and maintained by Sharon and Bruce Nyenhuis of Bentley Garden Design. Many of the impressive garden photographs on Colette’s website were taken by Sharon and Bruce and truly capture the extraordinary beauty of the spectacular garden landscape.